STOP HATING AMY ROSE!!!!!!!!!!!!!!! 😡😡😡😡😡. . HD Wallpaper and background images in the Ёж Соник club tagged: photo. This Ёж Соник photo might contain знак, плакат, текст, классной доски, and доске. 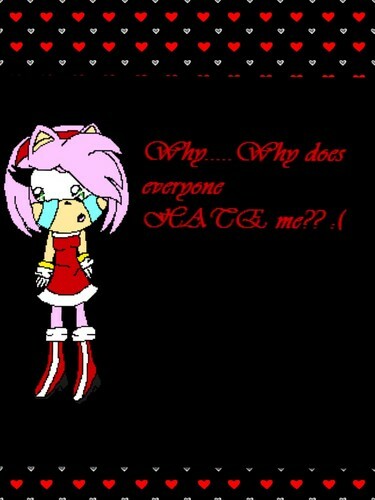 For the last time i don't hate amy rose i already explain i don't. What's wrong? why you looks so down? Dude. I get up at 6 am, do all the extra stuff at school to improve my grades, and now I'm hearing 'All girls are lazy' sh*t! Dude! In 3 world countries, females have to carry one or two big buckets of water, YOU CALL THAT LAZY! I bet your lazy you jerk! Can't take a joke and I wasn't talking to you ameliarose I was talking to amyrose94113 but you show up out of no where get on other people business you the one is a jerk here. I, really? The last time I remember, a jerk is someone that hurts other peoples feeling for a joke, oh, and look at that. You are hurting female kind by a joke, so I'm sure your the jerk here! Learn how to white a proper sentences kid looks like you the one is hurting other people feeling now and you keep talking about the past that you where arguing with me well guess what that's getting old already get over it. White? Don't you mean 'write'. And I never brought up the past between you and I. Learn your grammar. Yeah, unlike you, I can draw cartoon characters, and make people laugh if they need a joke. And besides we have bigger brains than you boys! Yeah okay sure they don't because they also lazy to do exercise but me I train with my brain and my body you know your brain needs exercise too right? Hey! I have to work with my brain a lot! Only because I have dyslexia, but noo... You are the one that is bragging, only because your a guy, WHY DO YOU MEN DO THAT?!? Not only you have to work your brain also you have to do exercise with it as well all you need to do it's keep stretching that if you wannabe flexible that always come with practice. What is with this? Boys are awesome, girls are awesome. OKAY????? No duh they both awesome of course i never say one of them is better.